What is Clean-Crafted Wine? Is it really that much better? And side-effect free?? 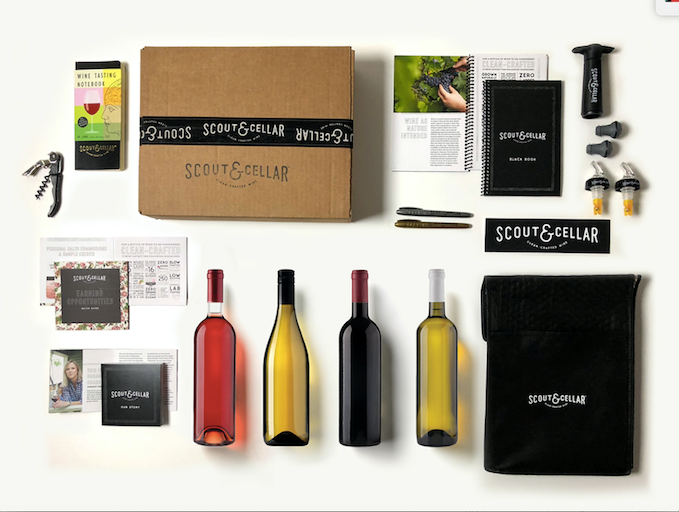 "Clean-crafted" wine is a trademarked term created by the Scout & Cellar wine company. Founded by an attorney (Sarah Shadonix) turned Level 3 Sommelier, Scout & Cellar was born out of deep dive on the ingredients in the majority of wines made and/or sold in the United States. While completing her Sommelier training, Sarah continued to get terrible wine headaches without any explanation. Rather than give up the trade and chalk the headaches up to a "wine allergy", Sarah went searching for answers. After speaking to wine makers, doctors, naturopaths, and pouring over the research, she realized it was the additives and pesticides in the wine process that were the culprits of her headaches. She was shocked to learn that there are 250 additives and 300 pesticides that are allowed in the wine-making process, many of which are not needed if the wines are properly crafted! She worked hard to create relationships with vineyards around the world that would meet stricter standards for their wine, and the clean-crafted movement was born. Yes, you read that right, that also means there are NO added sugars, and because the wines are fermented to complete dryness, all residual sugars are taken out as well. You know what that means? The wines are paleo, keto, and low carb friendly. AND the calorie count per glass is about 100 as compared to up to 300 calories with sugar-added wines! 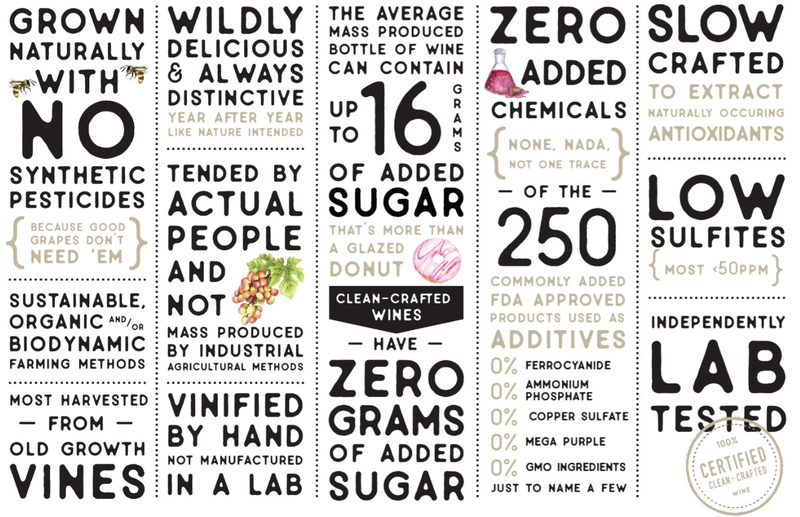 Tricky, though, you won't know if the non-clean-crafted wine you're drinking has added sugars, chemicals, pesticides, or what the calorie count is because the labeling requirements for alcohol are almost nil. Hence the creation of the Scout & Cellar clean-crafted seal. If S&C sells it, they guarantee the wine fits all of the listed qualities in the image above ^^. In many ways, this movement is to wine what the organic movement was to food in the US in 1990. "Does the wine taste the same? What if I don't like it?" The wine tastes like real wine, because it IS real wine! It's not watered down or full of artificial sweeteners. It's wine the way it was made before we started messing with the color, texture and taste through additives. Wine snobs in my immediate network (we're talking high-roller 'wineo's) who were originally skeptical have approved of the wines themselves! The only thing you won't taste is some of the heaviness that additives and pesticides can add. But if for some reason you don't like it, there is still a Satisfaction Guarantee. There's nothing to lose. Well, except those d*#m wine headaches! "Is the wine more expensive?" Is it more expensive than the $12 bottle from the gas station down the street? Yes. It should be. Just like a hamburger from McDonalds will cost less than a grass-fed burger from a natural burger joint, so too will mass-produced wine cost less than clean-crafted wine. Where mass-produced wine includes grapes (and subsequently the leaves and stems) harvested by a large machine, clean-crafted grapes are hand harvested and hand vinified. In mass-produced wine, rotten grapes are harvested by the machine and mixed in with the other grapes, whereas rotten grapes are noticed and excluded from hand-harvested grapes. 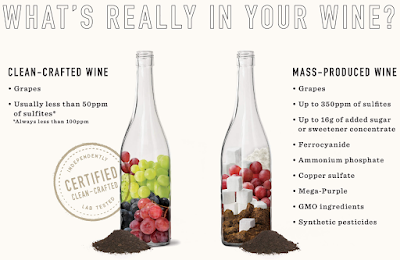 Mass-produced wine adds chemicals to offset the rotten grapes and stems, clean-crafted wines don't have to. Step by step throughout the production process, the clean-crafted wines have additional steps, attention to detail, and testing, resulting in a higher-quality wine with a higher production cost. A worthwhile cost! That being said, our wines start at only $19, and the price per bottle drops when you purchase in bulk or through the wine club. If you drink more than two bottles a month, there's a wine club option for you and subsequently a better price point you can enjoy. You can read about the club options here. The most you can get is 12 bottles sent every month and the least is 6 bottles sent every quarter. All reds, all whites or mixed, you pick! "How does Scout & Cellar know if a wine meets their standards?" They test it! Every batch! Scout & Cellar tests to validate the wines meet the clean-crafted list of requirements and are free of any modifications, additions, or synthetic pesticides. At ETS Laboratories they test for things like sugar, alcohol, acidity PH and more. S&C then sends the wines to UC Davis, the premiere vinicultural school in the US, and test for over 300 pesticides, including glyphosate. It is a residue test and it is expensive, but it is critical! "Isn't organic and clean crafted the same?" That's a question I get weekly. Fair question, but no, definitely not. Clean-crafted is a step beyond in the quest for "clean" wine because it is *just* grapes and naturally occurring sulfites. We only allow added sulfites if needed to keep the wine from turning into vinegar, and every bottle is certified less than 100 ppm (most are less than 50ppm), versus up to the 350 ppm allowed in regular wines. Organic wine can still add organic additives, such as sugar, processing aids, tannins, etc. and not tell you about it. "Tell me about the side effects that might go away with clean-crafted wines." I'll start this answer off with an important disclaimer... Scout & Cellar can't make any medical promises. I can only tell you about our personal experiences and those of the customers that have shared their stories. Here's my story. 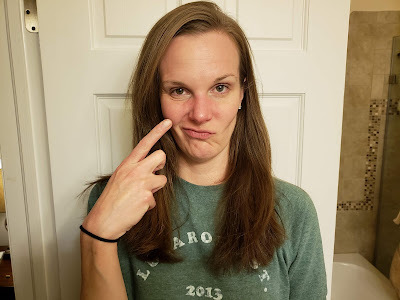 I STRUGGLE with a ton of food sensitivities, allergies, etc. I mean, it's gonzo the list of things I can't eat or drink with out some kind of reaction. Part of it is from a lifelong struggle with IBS, part of it is having Mast Cell Activation Syndrome and part of it is my Chronic Inflammatory Response Syndrome. You can click on those links to learn more, or just suffice to say I've got a hot mess of a body. I'm super sensitive. It's the worst. But I'm dealing. The picture below is of some face flushing I got after drinking organic wine (about an hour after it started to dissipate!). Anyway, a friend of mine who was familiar with my inability to tolerate alcohol without headaches, face flushing, and terrible hangovers (even with just one glass) suggested I try the clean-crafted wine. I was incredibly skeptical, because I react to "everything", but I was willing to take the risk and try it to have the luxury of adding wine back into my diet. I could not BELIEVE the difference I felt right off the bat! No headache, even with red wine. No facial flushing. No immediate "drunk and exhausted" feeling after half a glass. Just delicious, full bodied, high quality wine that I could sip like a civilized adult. Truth. The next day, a true test of the outcome, I felt SO much better than I've ever felt after a glass the night before. Normal even. I was shocked. And elated!! ASAP, I joined Scout & Cellar in their quest to push the standards in wine industry to a cleaner, healthier level. Can I drink two full glasses and not have an IBS flare? That depends on how well I'm eating and caring for myself outside of the wine. Alcohol will always aggravate certain health challenges, but as we chronic-health-issue folks know, if you can find a better alternative that will give you a semblance of normalcy while you take on your challenges, you will take it! Aside from me, there are countless other examples of people with mild to strong reactions to regular wines having little to no reaction at all to the Scout & Cellar wines. As long as your reaction is not a life-threatening one, we generally (and non-medically) say, "if you can tolerate a handful of grapes, you can tolerate clean-crafted wine." Pretty cool! "Are the clean-crafted wines all from one vineyard?" Nope! They are from vineyards all over the world! Sarah herself goes to the vineyards and wineries, meets with them and taste-tests wine. 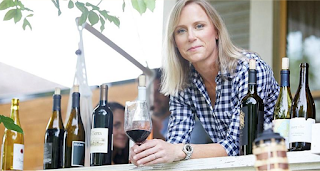 She even crafts many of the wines with them, using her sommelier knowledge to ensure an excellent sipping experience for each wine as well as a variety of flavor profiles across all the wines Scout & Cellar carries. Her goal was to not only create clean-crafted wine, but create a wine experience for customers that was inclusive of variety, quality, and wine education. "Do any other companies make clean-crafted wines?" No other wine company creates wines with the standards of Scout & Cellar, and especially not with the extensive testing they invest in. They are the only clean-minded wine company to allow a la carte purchasing of wines and customization of club memberships. Even more, the are the only company run by a sommelier (not to mention a Level 3!) who is committed to making sure every wine has a top-notch sipping experience. Lastly, they take extra steps to ensure the delivery of our wines is done with professional care (no hot wines showing up at your doorstep here). Become a customer - You can purchase wines a la carte HERE or just set up an account and stay informed until you're ready to buy HERE. If you do purchase a la carte, know that orders over $99 ship free, and you'll get a bulk discount for +6 or +12 bottle orders! Become a club member / subscriber - The membership is free and you can adjust or cancel it at any time with no penalty, which is pretty great. The variety of wines in each shipment are selected by our Level 3 Sommelier owner, they come with descriptions and food pairing recommendations for your education, and often include wines that are not available a la carte. Best of all, you get a 10% discount on 6-bottle orders and 15% off 12-bottle orders! PLUS, every shipment comes with an additional 10% off coupon to be used on any of the a la carte wines you might want to try, or to purchase additional bottles of wines you loved from your shipment! You can also gift the 10% off to a friend who wants to give the wine a try. Click here to join the club! 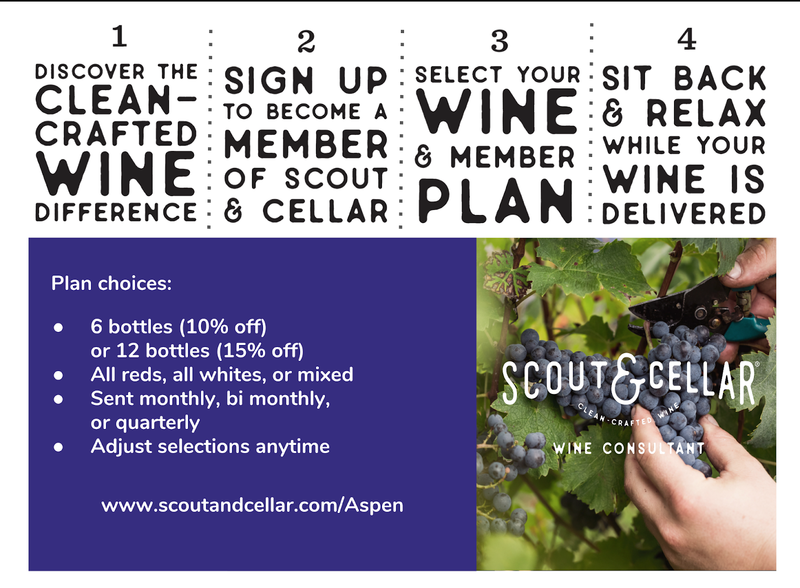 Become a Scout & Cellar Wine Consultant - For only $249, you can start your own wine business! You'll receive four bottles of wine, our Business Basics Kit, and a years worth of your own website. Not only will you have the best access to the clean-crafted wines, you will get commissions and free wine for sharing and enjoying the wines with your friends. The earlier you join, the greater your runway of opportunity! In my first month, I sold over $2,700 worth of wine, earned $400 in free wine, and had two people join my team. That's how ON FIRE this business is! There's zero inventory to manage or accumulate, no required monthly sales to stay active, and you can grow your business as quickly or as slowly as you like. You will learn a ton about wine along the way, meet other great people passionate about improving the quality of our wines, and get paid (in money and wine!) to be a part of an important movement! If you want to learn more about becoming a consultant, you can see FAQs HERE. If you just want to get started, you can sign up HERE. 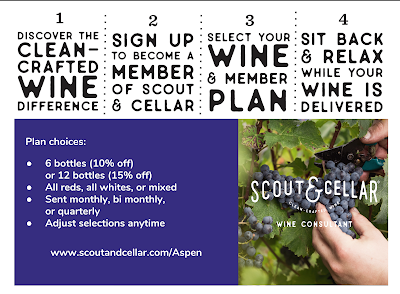 And if you would like to request additional details about the compensation plan, you can email me at scoutandcellaraspen AT gmail.com and I will send you all of the details. Those who join before January 2019 will get $50 back from me after you join, dropping the price to only $199! 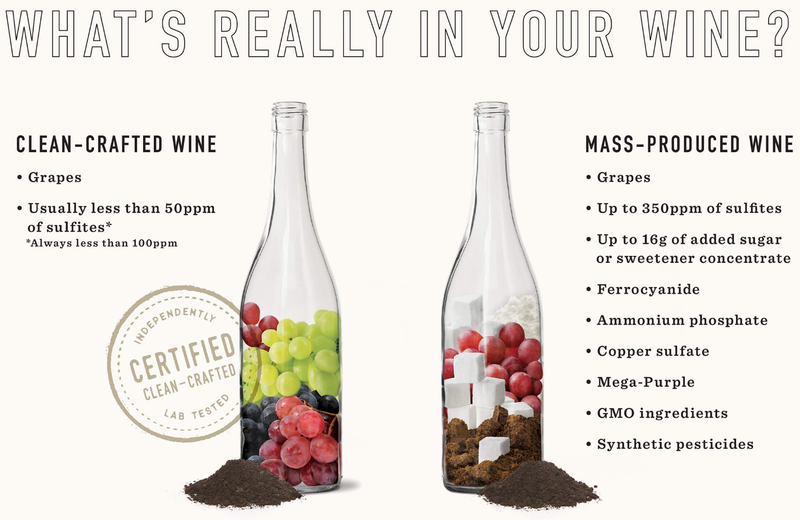 Welcome to the clean-crafted wine movement!